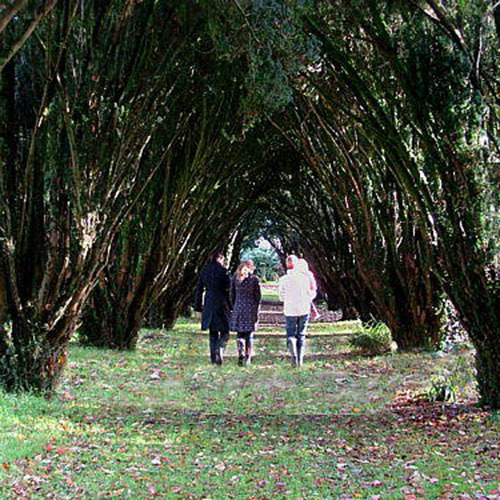 Stroll the Yew Walk on the Lisnavagh Estate, where you can plant a tree in Ireland. With Earth Day and Arbor Day occurring this past week, it reminded me that trees have played a central role in the practical and daily spiritual lives of the Irish people for hundreds of years. Trees served as landmarks and icons of family and clan identity, and their importance can be measured by the great number of tree-based place names in Ireland—of the 16,000 towns in Ireland, 13,000 are named after trees. Unfortunately, over the centuries, Ireland experienced a near-total destruction of its forests mainly because of human activity and a deterioration of the climate. Of Ireland’s total land surface area, just 10 percent is comprised of forests, which represents the second lowest proportional percentage of any country in Europe. The reforestation of Ireland is vital to Ireland’s long-term ecological health. As an old Chinese proverb espouses, the best time to plant a tree is 20 years ago; the second best time is now. Ever Irish Gifts has developed a unique “Plant a Tree in Ireland” program with County Carlow tree aficionado William Bunbury, whose love for trees in Ireland is unparalleled. There are few more epic ways to celebrate a birth, birthday, wedding, or anniversary than with the planting of a majestic tree in Ireland that your children, grandchildren, and their descendants can admire in generations to come. A beautiful, majestic tree is a living memorial of life-changing events. Its strength, long lifespan, and regal stature give it a monument-like quality and make it a powerful tribute to a life well lived or an occasion worthy of celebration. 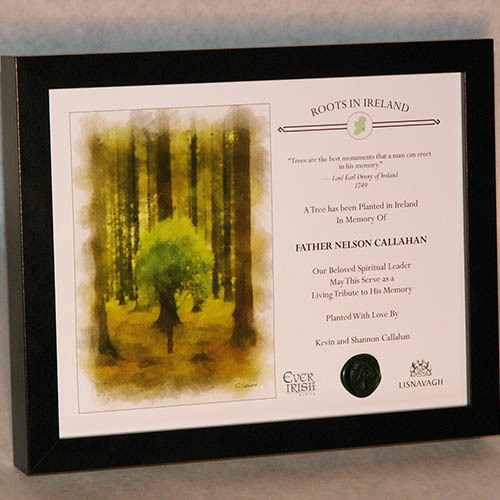 Honor or celebrate someone dear to you by planting a living, growing tree in Ireland in his or her name—a unique Irish gift to be treasured forever. The tree certificate makes a meaningful memento. We will notify the recipient of this very personalized gift by sending him or her a beautifully illustrated certificate bearing your own individual message. Information sent with this unique Irish gift includes directions on how to personally visit the tree, or to “visit” it virtually online using Bing maps. 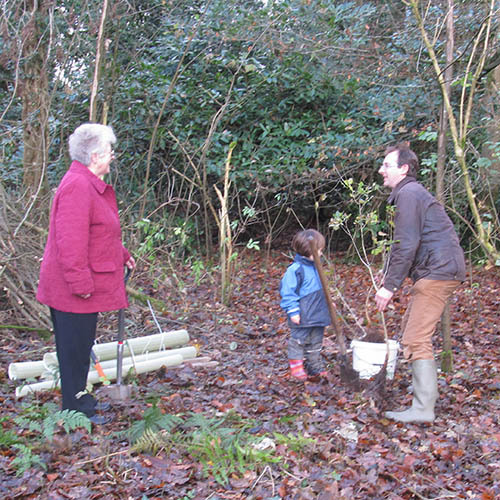 This http://www.EverIrishGifts.com customer was present as William Bunbury planted her tree in Ireland. One of our customers even timed a visit perfectly so she was able to actually be there at the planting of the tree she had purchased in memory of a close relative. Whether planted in celebration of a life event or in memory of a lost loved one, your unique Irish gift of planting a tree in Ireland is of critical importance to the sustainability and regeneration of the Irish woodlands, and it will contribute to maintaining and repopulating the country’s forestry, helping to keep Ireland green. If you are interested in planting a tree in Ireland, click here.